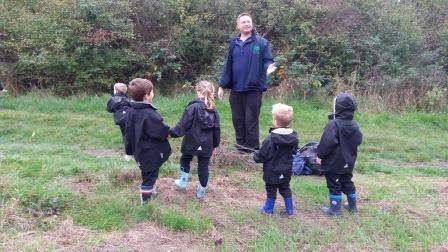 Ashtead Pre-Prep – Forest School Fantastic! Muddy wellies, BIG smiles and hot chocolate stained faces returned to school after Reception and Year One had a wonderful time at Forest School. The children had great fun exploring Ashtead Common, with the main focus of identifying the many colours and signs of autumn. The children were challenged to collect these signs, creating an ‘Autumnal Walking Wand’. The children decorated their wands with all they could find, high and low, displaying rich colours of gold, red, orange and brown! We were even lucky enough to see the cows grazing in a nearby field. What an adventure! Thank you Jay for a lovely day!